Has Mayor Levar Stoney flip-flopped on raising taxes? By Warren Fiske on Tuesday, March 19th, 2019 at 1:00 a.m.
Richmond Mayor Levar Stoney got an earful from City Councilwoman Reva Trammell moments after he proposed tax increases to improve public schools and infrastructure. "Mayor, you said you were not going to raise taxes when you ran for mayor," Trammell said during a March 6 council meeting. "How can you stand up here, and before all of us, do this to the people?" Stoney didn’t reply. 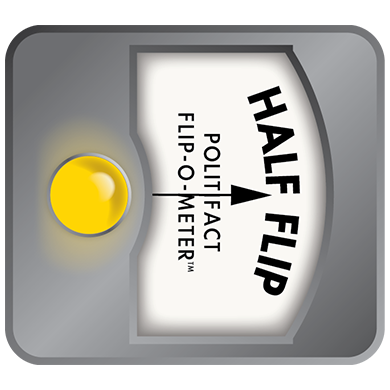 We put the mayor on our Flip-O-Meter to see if he has changed his position on tax hikes. Stoney is asking the council for a 9-cent increase in Richmond’s real estate tax rate that would set it at $1.29 per $100 of assessed value. He’s also wants to impose a 50-cent-per-pack cigarette tax. Richmond, home to global cigarette manufacturer Altria, is the only major city in Virginia without a cigarette tax. The real estate tax rate increase would generate $21.1 million for the budget year starting July 1, and the cigarette tax would raise $3 million. In addition to the combined $24.1 million tax hike, Stoney expects $22 million to come in from rising real estate assessments. With council approval, Stoney would spend $18 million of the new money on public school programs and $19 million on infrastructure. In 2018, Stoney persuaded the council to raise Richmond’s 6 percent meals tax at restaurants to 7.5 percent. That’s generating $9.1 million a year to finance renovation and replacement of decrepit school facilities. We asked Trammell for proof of her claim that Stoney, during his 2016 campaign, said he wouldn’t raise taxes. She said she didn’t remember a specific occasion but, perhaps, he said it during an appearance in her home 8th District in Southside Richmond. We couldn’t find a recording or a news story on that event. A dive through recordings and newspaper stories from the campaign shows Stoney’s tax stance was, for the most part, consistent. His stock comment was, while the city needed money for schools, increasing taxes - other than for cigarettes - was a last resort. "Before we get to that step, have we exhausted every avenue?" he said in a July 10, 2016 Q&A with the Richmond Times-Dispatch. "Have we fought for our fair share from state government? Have we teamed up with the federal government to bring dollars back to Richmond, and have we gone out and found those philanthropic dollars ... to help augment our current financial situation? I think we have not done that." During a Sept. 20, 2016 interview on WTVR-TV, Stoney said, "I have no plans on raising any taxes. Right now, we have a city hall that’s swollen, we have over 4,000 employees in City Hall. I think you’ve got to look at some cuts over there. You’ve got to look at making a tighter ship. But also, I think you’ve got to find ways to be a little more creative about our dollars." During a Sept. 25, 2016 Q&A with the Times-Dispatch, Stoney said the city would have to improve its efficiency in collecting existing taxes "before we start raising taxes, before we have that discussion…"
We came across one instance, however, when Stoney abandoned his usual caution and pledged not to raise taxes. It came during the "lightning round" of an Oct. 17, 2016 debate, when Stoney and his mayoral rivals were asked to answer questions in five words or less. "Would you raise taxes?" the moderator asked. Stoney replied with one word: "No." After taking office on the last day of 2016, Stoney seemed increasingly open to tax increases, but not necessarily on real estate. The Times-Dispatch reported on March 1, 2017 that his political action committee was polling Richmond residents on whether they would support tax hikes. During a Dec. 24, 2017 Q&A with the Times-Dispatch, he said "everything is on the table," for raising school funds, including a tax-increase plan that "is well thought out." While proposing the meals tax hike on Jan. 22, 2018, Stoney said, "For the last year, I’ve said that when it comes to meeting the critical needs of school facilities, the only option that’s off the table is doing nothing." But on Oct. 17, 2018, Stoney distanced himself from a call by Richmond School Superintendent Jason Kamras for a 10-cent increase in the real estate tax rate. According to the Times Dispatch, Jim Nolan - Stoney’s spokesman - said Kamras didn’t confer with the mayor before making the call and that Stoney "has no current plans to propose a real estate tax increase." Has Stoney flip-flopped on not raising taxes? Stoney had a nuanced answer almost every time he was asked about increases when he ran for mayor and during his first year in office. While stressing Richmond needed more money for its schools, he said raising taxes - other than for cigarettes - was a last resort, to be taken only if government efficiency efforts came up short. For the most part, Stoney remained consistent. He took several steps to streamline services and improve revenue collections before proposing increases in the meals tax last year and the real estate tax this year. We found one time, however, when Stoney strayed for his script. During the "lightning round" of a mayoral debate three weeks before the 2016 election, candidates were asked to state in five words or less whether they would raise taxes. Stoney said "No." Stoney’s answer doesn’t rise to the "Read my lips" vow not to raise taxes made by former President George H.W. Bush in 1988 - only to be broken. To our knowledge, Stoney never repeated the no-new-tax pledge. And his promise came in response to a question that was asked in a way that didn’t allow his usual conditional response. But Stoney did say "No," in contrast to his many other statements keeping tax increases as a possibility. So, overall, we rate this a Half Flip. Published: Tuesday, March 19th, 2019 at 1:00 a.m.
Reva Trammell, Comments at Richmond City Council meeting, March 6, 2019 (31:44 mark). Interview with Trammell, March 14, 2019. Stoney, Budget proposal, March 6, 2019. Richmond Times-Dispatch, "Stoney proposes raising Richmond real estate tax," March 7, 2019. Richmond Times-Dispatch, "An explanation of the proposed meals tax increase in Richmond," Feb. 2, 2018. Richmond Times-Dispatch, "Mayoral candidates in their own words on schools, city CAO, debt, stadium, Redskins," July 10, 2016. WTVR-TV, "Levar Stoney answers questions on Facebook live," Sept. 20, 2016 (9:56 mark). Richmond Times-Dispatch, "The mayoral debate," Sept. 25, 2016. Stoney, Comments at mayoral debate. Oct. 17, 2016 (51:13 mark). Richmond Times-Dispatch, "Mayor’s PAC polls residents on possibility of higher taxes," March 1, 2017. Richmond Times-Dispatch, "Q&A: Richmond Mayor Levar Stoney looks back on his first year in office, ahead to 2018," Dec. 24, 2017. WTVR-TV, "Mayor Stoney proposes meals tax increase to fund school facilities improvements," Jan. 22, 2018. Richmond Times-Dispatch, "Kamras wants real estate tax hike; Stoney demurs," Oct. 18, 2018.